Geraldine Claire Guest is putting on a brave face at the prospect of having to uproot herself from an idyllic farm cottage near Firle, East Sussex. The farmer now needs the property she has been renting, which means the loss of her stone-carving studio and a temporary stop on the fresh ideas that have kept her varied artistic career evolving for some 30 years. When I visited her in the spring she was planning a farewell exhibition to be shared with artist friends across a mix of media - including Chris Coleman, featured in the last issue - and was toying with the idea of moving to Lyme Regis, Dorset - providing she could find a studio. A tour around the house and garden is a pictorial time line of how her interests and career have developed: life study on the stairs; clay bust in a corner of the kitchen; unfinished Caen limestone head in the garden, which she says was started last year. "That's what happens with non-commissioned sculpture," she explains. "The stone carving evolves. This face is not properly right. It's starting to look too Egyptian and I don't want that. The face has got to go back. At the moment it looks like Hitler. I go and draw in the British Museum from the Graeco-Roman collection, and study the Egyptians too, so I observe what nose goes with what and so on." Geraldine trained in textiles at Worthing. She had originally wanted to be a scribe, working on illuminated script, but later opted for textiles, only to find the college was too conceptual for her taste. So she moved laterally, buying for a Habitat-type shop in Horsham, West Sussex. Then, having watched lacquered furniture subjected to the late 70s' desire to strip down to bare wood, she decided to learn how to restore oriental pieces. After a stay in Australia, where she made a lacquered panel for a bar, she returned, learnt gilding conservation and worked as a conservator at the Royal Pavilion, Brighton. After taking a ceramics conservation course at West Dean College, near Chichester, she set up her studio at Firle before going on to become Curator at nearby Charleston Farmhouse, once home to Vanessa Bell and Duncan Grant and their Bloomsbury Group circle. She stayed for eight years, until the intensity of the house that the group filled with their artwork got to her. "I felt the ghosts of the Bloomsburys," she recalls. By the early 90s she was concentrating on life drawing. "I just drew and drew and started exhibiting." 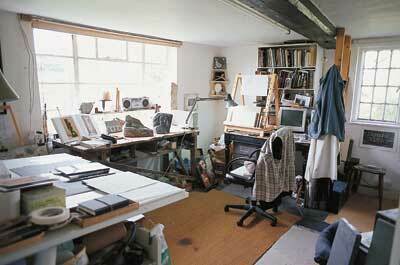 Then came an MA in Design History at the Royal College of Art, where she met Brian Kneale, then Head of Drawing. "He had a powerful influence on me. He was a 'yes' person and said I had to follow my heart. I did a dissertation on wax anatomical figures. 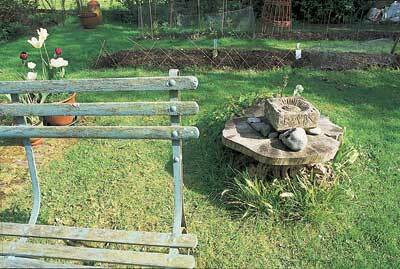 I was supporting myself doing aromatherapy and garden design. "Then I went to an exhibition of John Skelton's and got talking to a friend of his, Glynis Owen-Jones who is also a Fellow of the Royal Society of British Sculptors. She said she did stone carving. I started travelling one day a week to London to work with Glynis, which was really extraordinary and meaningful for me. She is a wonderful teacher and carver. "There's no doubt that any form of private one-to-one tuition works. As you start to dilute it you start to lose it. Glynis was so encouraging. She said you are either a sculptor or you are not, depending on whether you can work well with tools and have the feeling for it. "Because of my restorer's background tools feel comfortable. Manual dexterity is my biggest asset, so tools feel familiar not strange." As well as sculpture she likes to cut letters on sculpted plaques, bird baths and so on, which, she says, sell well at exhibitions. Not being academic at school, she had found joy in art, cooking and needlework. Now she teaches children privately and is shocked that some have only one hour of art at school per fortnight. "It comes back to the William Morris ethic of the teaching of practical things, to learn about detail and how materials work to make something creative and beautiful. I had a fantastic art teacher and was so thrilled that I could do something. It's important to have a visual language; it carries you through life, akin to a spiritual underpinning." She says she's not very good at marketing her work. She sells at exhibitions and has exhibited at her own home, in London and in Brighton. She admits to being hopeless at totting up the hours spent on work so settles for charging what she believes people will pay. A life-size bust in limestone, for instance, would cost from £500 to £600. "There's nothing more crazy than seeing an artist surrounded by too highly priced work - it's like being constipated. On the other hand, I do like to live with a piece of work for a while, to get to know it. "Last year I sold a male torso to a pub. I got Â£2,100 for it. It's starting to age now and looks fab. If it were London I could have charged Â£15,000 for it." Geraldine normally works to commission, completing six or so pieces a year, but the buyers saw the sculpture at John Skelton's exhibition during Brighton Festival 2001 and bought it. She talks about the differences between stone and wood carving and observes that stone carving went from the classical to the avant garde after modern artists studied primitive art, but that that never happened with wood carving. "Wood is more user friendly and it produces a dust that smells wonderful. A friend started a piece in lime wood and the chippings are wonderful. Not so with stone; sulphur dioxide is released from York and Portland stone." Her first piece of carving was in soapstone. 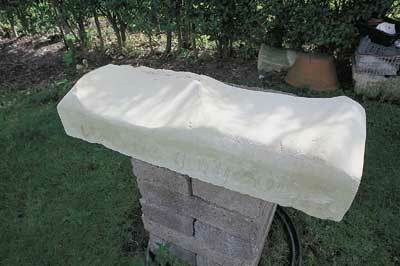 "Soapstone is one of the best to start stone carving with because you can almost whittle it. I've never worked in wood because it demands another set of tools. I already do too many things." 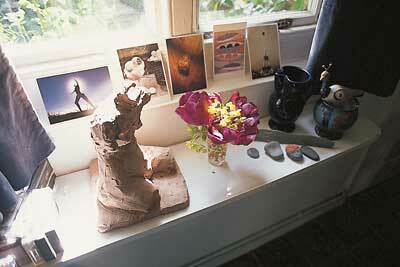 She has sculpted in clay but says: "The problem for me working in clay is that it involves too many processes. Forget it! But it's lovely working with something malleable. "I'm impulsive. I have to learn patience. Stone carving is direct but the process is long. I leave pieces for four years; sometimes you need to walk away from a piece and allow time to come back to it. You might need to make a crucial change," she says, adding that to do that she had to take time away from it and think herself into the new direction. "Commissioned work is good for me because it pushes me through those barriers." 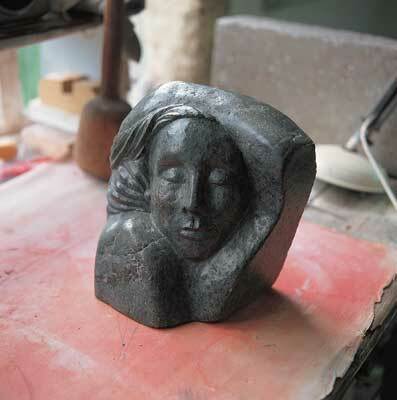 She likes to recycle stone that has already been carved and says: "There's a mystery to carving. You have to honour the stone first. When working with recycled material which may come from a cathedral you have a starting point. The work is sacred and a great gift to metamorphose. A lump of stone is a beautiful object and what I make has to be beautiful. I'm not into the art of the moment, conceptual art which comes from the mind. I hope my art comes from the heart. As a personality I have to move away from pieces of work, otherwise I wear myself out. "I'm a garden designer, aromatherapist, do a bit of teaching, which is all very demanding work because you are giving all the time, but when I'm engaged with carving or with plants I'm never happier because this engagement is very powerful." When letter cutting, Geraldine advises working from the bottom upwards so you don't cut out the tracings, and from left to right even if left handed. She advises: "Never start with the first letter because you will be more tentative when you start and the first letter should be strong. "When sharpening chisels for letter cutting, test them on your thumbnail. If it catches it's sharp enough - and you've wrecked your thumb. "Make stops at the top and bottom of each letter. Keep working up the central groove. It's the turn of the chisel that does the job. To make it easier for myself I turn the stone around on small pieces rather than turning the chisel but that's not the proper way. You just go on deepening and broadening. You can also make little chopping movements instead of flowing up, then you'll remove more." 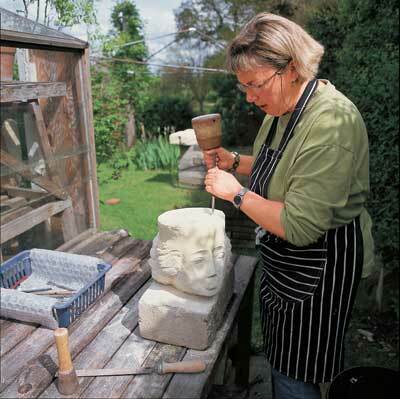 Using the unfinished head, see main text, Geraldine takes me through the stages of stone carving and the tools used. She says that because of silica and chippings it is important to wear gloves, mask and eye protection. A banker on which the carving is placed while working can be cheaply made out of concrete blocks. She draws the design onto the stone with charcoal, then advises that a wooden mallet should be used with mallet-headed chisels, and metal or plastic mallets with non-mallet-headed chisels. Chisels come in forged steel or the much harder tungsten which is used for letter cutting. With letter cutting, she explains, you have to resharpen sometimes as often as each letter because of the precision needed. A wedge-shaped pitcher or handsaw is used for taking out large lumps. A point held at virtually a right angle is used for roughing out and taking out large areas. Progression is via a claw with serrated edge which gives a sense of movement. A flat chisel is used to start removing grooves and to put in details, planes and angles. Use of a riffler equates to the sanding process used in wood carving. Finishing is achieved with a wet-and-dry sandpaper technique, starting with 240 and going up to 400 grit - up to 800 grit for slate - and being careful to change the water between each grade – crucial with slate and very dense stone. Decisions have to be made about polishing. Geraldine does polish soapstone, for example, but not limestone because she prefers to leave texture showing. Polishing is achieved with a microcrystalline wax. To obtain stone, Geraldine advises making friends with your local monumental mason or cathedral works, or visiting the island of Portland, Dorset, where offcuts can be picked up from quarries. "When making a piece for a commission or to sell, make sure it has been pretty freshly quarried. I use recycled stuff and have to take a lot off. In carving you will always have to lose at least a third. "When buying stone check it for a ringing tone. Carry a hammer and chisel with you. If it has a nice ring it probably means it hasn't any fault. If it starts to thud you've probably got a problem. If you wet it you'll probably be able to see some fault." 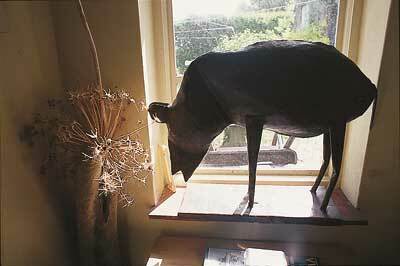 For soapstone she suggests a visit to Polyphant in Cornwall where stone of the same name is quarried.